Following a rigorous competition that tested their abilities in STEM, critical thinking, communication, creativity and collaboration, the Broadcom Foundation and Society for Science & the Public announced today the 2017 Broadcom MASTERS winners. Faris Irwin Wald, 15, Santa Fe, NM, won the coveted Samueli Foundation Prize, the top award in the Broadcom MASTERS. Thirty finalists, including Faris, took home a total of $100,000 in awards. WASHINGTON, D.C. — Being able to better estimate the number of hurricanes, typhoons and other such storms that ravage the Earth each year would be a nice feat. This week, Faris Wald, 15, presented research that might help tackle that challenge. He also swirled through a demanding series of science, engineering and math challenges here in the nation’s capital. And on October 24, he claimed the Broadcom MASTERS’ top prize, an educational award worth $25,000. Faris Wald, 15, of Santa Fe, N.M., garnered the top prize of $25,000 at this week’s Broadcom MASTERS competition. His research suggested a link between the annual number of cyclones (hurricanes) and the number of coronal holes on the sun a year earlier. Faris hails from Santa Fe, N.M. He learned of his win at an awards gala on Tuesday evening. “I have so many mixed emotions right now, and I’m definitely surprised,” he says. 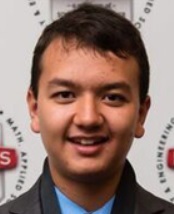 Faris was one of 30 finalists from 17 states in the seventh annual Broadcom MASTERS competition. MASTERS stands for Math, Applied Science, Technology and Engineering for Rising Stars. The program was created by Society for Science & the Public (SSP). The Samueli Foundation provided Faris’ winnings. This non-profit organization was created by Broadcom founder Henry Samueli. Overall, more than a dozen finalists took home major cash awards or the funds to attend a science camp of their choice. Students qualified for the competition on the basis of a middle-school science fair project. Those projects fall within the fields of science, technology, engineering or mathematics (STEM). Finalists had to be in the sixth, seventh or eighth grade when they competed at the local level. But Broadcom MASTERS is much more than a science fair. Indeed, those qualifying science-fair projects account for only about one-fourth of a finalist’s total score. In his qualifying project, Faris looked at the number of cyclones that scientists have tallied worldwide in recent years. (“Cyclone” is a general term for large, strong whirling storms. In the North Atlantic Ocean and northeastern Pacific, those storms are called hurricanes. In the northwestern Pacific, they’re known as typhoons. Elsewhere, they’re just called cyclones.) The number of such storms vary from year to year in a seemingly unpredictable way. But Faris noticed that something else also varied from year to year: the number of dark regions in the sun’s atmosphere known as coronal holes. These features appear when the lines in the sun’s magnetic field stretch far out into space instead of connecting back to the sun’s surface, as they normally do. Coronal holes occur in the sun’s outer atmosphere. Being cooler patches of the atmosphere, they appear darker. The rise and fall in the number of cyclones, from year to year, didn’t exactly match the rise and fall of coronal holes. Instead, the number of coronal holes in any one year seemed to be related to the worldwide number of cyclones the next year. Faris e-mailed several scientists about his findings. They noted that his results did indeed show a strong statistical link between the numbers of coronal holes and cyclones. For now, however, they can’t come up with an explanation for why the two phenomena might be correlated. There’s a chance the apparent link he turned up could be just a coincidence. “Congratulations to Faris, whose impressive project has the potential to help us better understand the sun’s power to influence weather, such as cyclones,” says Maya Ajmera. She is president of SSP, which publishes Science News for Students. The largest share of Faris’ winning score came from his performance in a series of science challenges. Even before arriving in Washington for the finals, he and the other competitors had been grouped into five-member teams. Throughout two days of the finals, each team performed tasks, such as designing electronic circuits (completed when a ball rolled across a sensor) and games that teach players about nutrition. One challenge asked each team to design and build a remotely operated vehicle that could dive more than 2 meters (6.6 feet) to collect river sediment. In all, these finalists competed for $100,000 in awards. This year’s group of finalists included an even split of 15 girls and 15 boys. They had been selected from almost 2,500 students that had entered this year’s Broadcom MASTERS competition. That first group of entrants came from 49 states, 4 U.S. territories and one school located on a military base overseas. The field was narrowed to 300 semifinalists. The 30 finalists who took part over the last week were selected from that group. Emily Tianshi, 14, won the Robert Wood Johnson Foundation Award for Health Advancement. It is worth $20,000. This teen from San Diego, Calif., had studied how moisture condenses on the needles of trees known as Torrey pines. Meghna Behari, 14, from Sewickley, Pa., took home the Marconi/Samueli Award for Innovation. It is valued at $10,000. She designed and built a battery-powered craft that tests and monitors water quality in ponds, lakes and streams. Helen Lyons, 14, won the Lemelson Award for Invention, worth $7,500. This New York City teen designed a device to generate electricity from ocean waves. Additional finalists took home first-place awards, worth $3,500, or second-place prizes valued at $2,500, in each of the STEM fields. First place: Pujita Tangirala, 13, from Los Gatos, Calif. She studied how dried leaves left behind after brewing tea could be used to remove dyes from waste water. Second place: Jessie Gan, 14, from San Diego, Calif. She compared how certain chemicals known as antioxidants can alter biochemical processes in yeast cells. First place: Herin Kang, 13, from Los Gatos, Calif. She designed and built an aquarium-like device, only a couple centimeters (about an inch) thick to be placed in front of an outdoor window. Between its panes of glass, are communities of algae. As sunlight shines onto them, they sop up carbon dioxide from indoor air and release oxygen. Second place: Anthony Hill, 15, from Holladay, Utah. He’s interested in how plants might be grown by some future Martian colony. His project probed how low atmospheric pressures, such as those on Mars, would affect chemical reactions in the leaves of a variety of plant species. First place: Andrew Chiang, 15, from Saratoga, Calif. He built a device to move small objects using a “force field” generated by high-frequency sound waves. Second place: Spencer Green, 13, of Huntington Beach, Calif. He built electronic devices that emitted sounds. Their frequency related to how fast they were accelerating (or moving). Such devices might, for instance, one day monitor and provide immediate feedback to tumbling gymnasts. First Place: Zoe Gotthold, 14, from Richland, Wash. She developed a simple way to estimate how long it would take for an emulsion — such as spilled crude oil mixed with water — to dissipate naturally. Second Place: Sara Kaufman, 12, from Cooper City, Fla. She built her own wind tunnel and studied how structures added to the roof of a home might protect that roof from damage by a hurricane’s high winds. Two additional finalists earned Rising Star awards. They are Mithra Karamchedu, 13, of Portland, Ore., and Regan Williams, 12, of Wilmington, N.C. Each will take part in the Broadcom MASTERS International event in Pittsburgh, Pa., next May. As part of that trip, they will attend the Intel International Science and Engineering Fair. Also an SSP program, Intel ISEF is the world’s largest international science fair competition. “Now, more than ever, it is critical that we support our young scientists and cultivate their interest in STEM so that they can go on and solve many of our world’s most intractable problems,” says Ajmera. coronal holes Parts of the sun’s corona (outer envelope) that are cooler and thinner than average. Society for Science & the Public. This nonprofit organization was created in 1921 and is based in Washington, D.C. Since its founding, SSP has been not only promoting public engagement in scientific research but also the public understanding of science. It created and continues to run three renowned science competitions: The Regeneron Science Talent Search (begun in 1942), the Intel International Science and Engineering Fair (initially launched in 1950) and Broadcom MASTERS (created in 2010). SSP also publishes award-winning journalism: in Science News (launched in 1922) and Science News for Students (created in 2003). Those magazines also host a series of blogs (including Eureka! Lab).